Are you planning to purchase a garden tractor to take care of your gardening needs? Did you know that garden tractors can do more than a regular lawn mower? This is the reason why more and more people are thinking of the best garden tractor machines. One of the easiest gardening equipment is the garden tractor. They are designed for the residential gardens. If you are planning to buy a garden tractor for your lawn, then knowing more about it is essential. Below are some of the information that you need to know. A garden tractor is built sturdily yet light-weight. It can easily operate and has different attachments to make the job easier for the user. Its engine, which is either vertically or horizontally mounted, consists of various convenient parts. ​Before digging deeper into tips, let’s find out why many gardeners choose garden tractor over lawn mower. Is there any mysterious myth behind this decision? 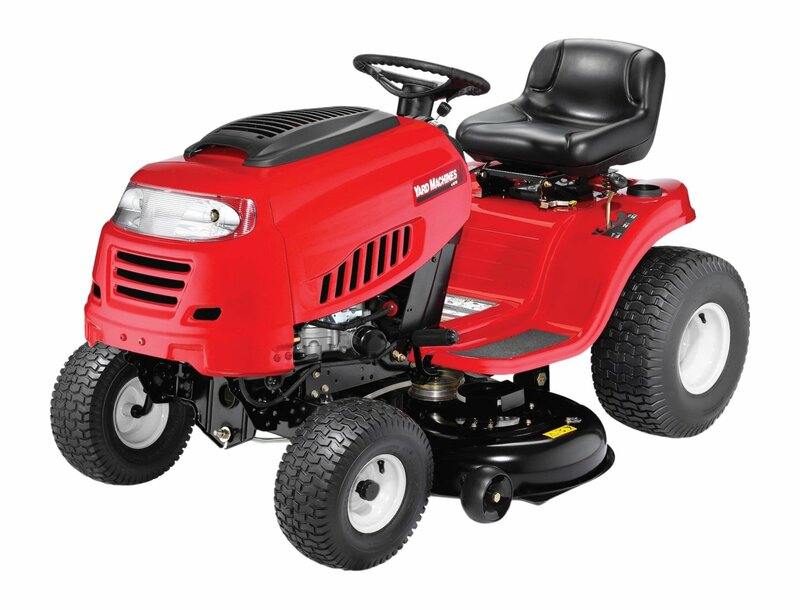 If you are looking for a ride-on machine yet wondering between riding mower and garden tractor, the guidance below will help you differentiate them and make the best decision. With small horsepower model, the lawn mower can handle more than an acre yards. However, if your garden is larger than two acres, you should make extra investment into garden tractor. The comparison with cover the differences in function, size, power and cost. In terms of function, with smaller wheels, lawn mower can maneuver easily around tight spots. However, with a slightly bigger garden, garden tractors is competent in hauling materials. Their heavier-duty frames, larger cutting decks and a wide variety of attachments make it possible to clear snow, grade garden, dig furrow and tow heavy equipment. If you have a lot of heavy tasks, garden tractors are undoubtedly better choice. ​Regarding size, garden tractors are larger than lawn mowers because of larger wheels, more powerful transmission, studier axles. Therefore, garden tractors weigh more, which is suitable for hilly terrain. Depending on a wide variety of functions, garden tractors have higher horsepower (20-30HP) as well as larger engines, which can mow up to over 5 acres areas. With only 15-25 HP, lawn mower weighs less. ​Being a more versatile machine, garden tractor is usually more expensive than standard lawn tractor, ranging from $2000 to $9000. However, if you have no intention of owning a big yard, the price of lawn tractor will cost you between $1000 and $3000. ​The lawn mower can beat garden tractor in accessing to hard-to-mow areas. Whereas, a tractor is designed for heavy-duty work and a larger area with various terrain. ​Another benefit of garden tractor is the ability to attach many tools listed below. Beside the main function mowing grass, garden tractor can clear snow with snow blower. It is mainly used to clear the snow and blow them out from the sidewalk or a pathway in your garden. Snow blowers can easily be maneuvered since they are light in weight. The sweeper is a helpful attachment for the maintenance of your lawn. It is a brush that has several sections of bristle and can be positioned in three different ways, such as the straight position, left and as well as the right. The sweeper will help you remove debris, sticks, and leaves from the driveway, sidewalks, and lawn. The shredder and chipper are made out of steel, which is why they are heavy. The chipper is responsible for shredding the limbs. The shredder shred stalks, leaves and all kinds of garden waste while collecting everything in a chamber. Another attachment is the tiller, which is typically used in narrow yet open space. The soil can usually be tilled depending on the requirement depth of the seedlings or seeds. The tiller can also control and remove weeds as well as loosen up the soil between the rows of plants during the growing season. It works by chopping the remaining plants and burying them in the ground. But how is it being operated, you may ask. Here are a few tips that you should take note of when operating the garden tractor that you are going to purchase. Garden tractors come in different brands. Therefore, there are differences between the manual. If you had owned a garden tractor before, don't assume their manuals are all the same. If there are no manuals, check the website of the manufacturer for specific details. Before you turn on the switch of the tractor, test the switches and controls. You need to make sure that you are familiar with the functions of every switch and control in the tractor. If you have purchased any attachments, ensure that you have installed them correctly. It is advisable that the tractor is put into a neutral mode while you start it. The safety shields and guards should be in the right places. If you see any loose bolts and nuts, you need to tighten or replace them if they are already damaged. If a lawn tractor isn’t good enough for renovating your property, it’s time for you to get a garden tractor instead. Characterized by beefy power engines and extremely durable tires, a garden tractor is your best friend when it comes to managing acres of grass. In general, garden tractors have the appearance of a relatively smaller farm tractor. They have big wheels located at the back and have bulky frames. Also, these machines let you carry heavy loads with their sturdy axles and transmissions. Of course, this machine can clear huge lawns thanks to its detachable mower decks measuring at least 45 inches in length. Thanks to three sharp blades and an engine providing no less than 20 horsepower, you can mow down acres of land efficiently. Lawn tractors can also be used for pulling carts and sprayers around your property, but garden tractors easily beat them in terms of heavy-duty usage. Likewise, lawn tractors cannot have attachments such as snow throwers, tillers, cultivators, and dozer blades because they do not have the same sheer power of garden tractors. Thus, garden tractors can become multi-functional machines with the help of several attachments. Read also: What size of garden tractor do I need? The welded front axles of lawn tractors are typically made of steel. However, the axles of garden tractors are tougher because they are created with either forged or cast iron. Usually, a garden tractor will have an Overhead Valve or OHV engine combined with a twin cylinder design. Together, these sections provide great horsepower not just for handling lawns but also for enhancing the capabilities of attachments such as tillers and blades. After understanding what makes a garden tractor important and different from a lawn tractor, you should now dig into specific details. As always, conducting research on your own and asking for professional advice will help you understand the strengths and weaknesses of each garden tractor model. Sure, a garden tractor is not as big as a farm tractor, but it’s still capably large. Once you’re done using it, the machine needs to be storage-friendly. By this, you should have enough space to store the garden tractor, especially during the cold season. If you cannot find a relatively warm area to store the garden tractor, its performance could be negatively affected by accelerating wear and tear. In addition, if using the machine like a snow blower you should find out first whether you can store the tractor properly before buying it. To ensure that you have sufficient tractor storage, you have to take note of several things. First, check the dimensions of the garden tractor. Next, measure the width of all the doors, gates, and other areas the tractor will go through in order to be safely stored. Generally, garden tractors have a sturdy appearance. Still, we need to pay special attention to see which models have the most reliable parts. After all, the machine needs to stay whole even when it’s dealing with a staggering amount of stone and broken earth. You should look at the quality of the axles, rods, and of all the connectors. It’s not uncommon to find garden tractors with axles no thicker than half an inch of steel. While they look nice for their slim profile, these axles won’t likely survive after a year or two of property management and renovation. Moreover, check the bearings and other friction-prone sections for grease fittings. You do not want a tractor without these lubrication points to keep operations smooth. Furthermore, it is wise to check if the wires are accessible to tinker with in case problems arise. The size of your property also affects what kind of garden tractor you should buy. If your area is less than two acres in size, a tractor with a 45-inch mower deck should do. Otherwise, a garden tractor with a 54-inch mower deck – the biggest possible size for such a machine – should do the trick. Of course, you can still use a 54-inch mower deck for smaller properties. By doing so, the mowing process is quickened since this wide deck will cover more sections in less time than a 45-inch variant. You do not have to buy the garden tractor with the largest horsepower. If you’re primarily going to use the machine for mowing vast tracts of grass, a 20 horsepower tractor should do.However, you should definitely look for tractors with a higher horsepower going as high as 30 if you do heavy-duty operations such as constant digging, tilling, and hauling heavy things. We’ve already mentioned that garden tractors are capable of doing more than just mowing grass with the help of attachments. However, not all garden tractors can use any available attachment. Some machines have a power take-off (PTO﻿﻿﻿﻿) hitch allowing a variety of powerful attachments while some tractors do not. In conclusion, a garden tractor is built for managing properties that a mere lawn mower can’t handle efficiently. While they do have common characteristics, garden tractors do differ in horsepower, mower deck size, and the number of compatible attachments. Furthermore, your property size and the functions needed to be performed will help you pick the best garden tractor. After reading through the tips and precautions, you can find the suitable model with the review list below. Poulan Pro 960420186 Briggs 24 hp Automatic Hydrostatic Transmission Drive Riding Mower has a 54-inch vented reinforced deck draws air from the top part of the deck. This results in better air flow and movement when mowing longer grasses. The speed can be adjusted because of the auto hydrostatic transmission. To increase the speed on the ground, you can use the Motion Lever feature on the fender. No wasting time for changing speeds. Powered by the Briggs and Stratton Over Head Valve Engine with the pressurized lubrication, this machine can run cleaner and cooler. You also don’t need to choke or prime the engine because of the available ReadyStart system. 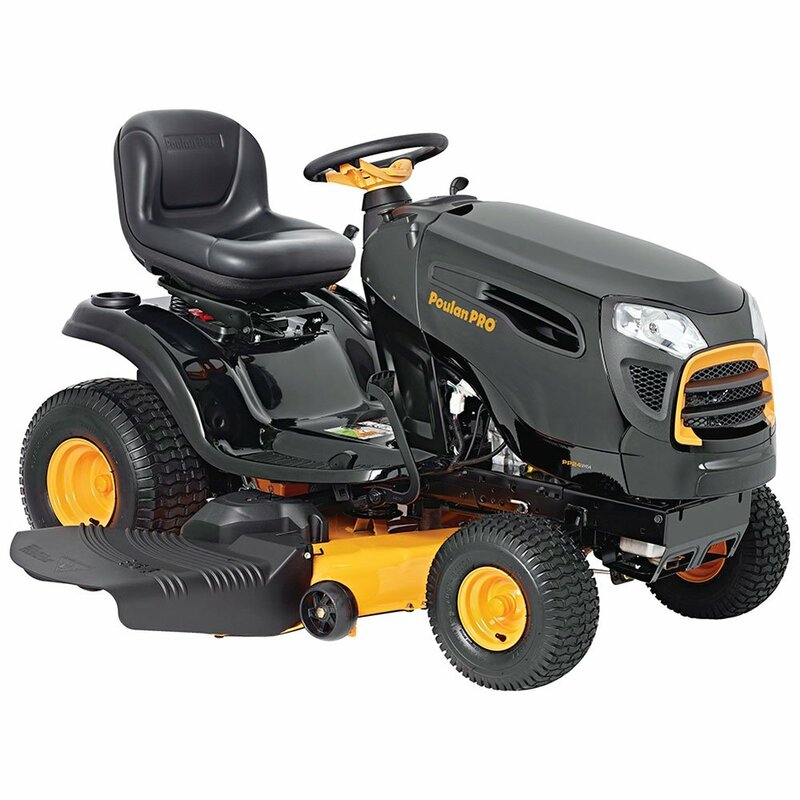 Husqvarna 960430211 YTA18542 18.5 hp, 42” can offer the desired performance. It is pedal operated, which will let you adjust the reverse and forward speeds smoothly. The machine comes with the 18.5hp engine and 42-inch wide cutting. This tractor can smoothly move on a sturdy 15 by 6.6-inch front and 20 by 8.8 inch rear tires. 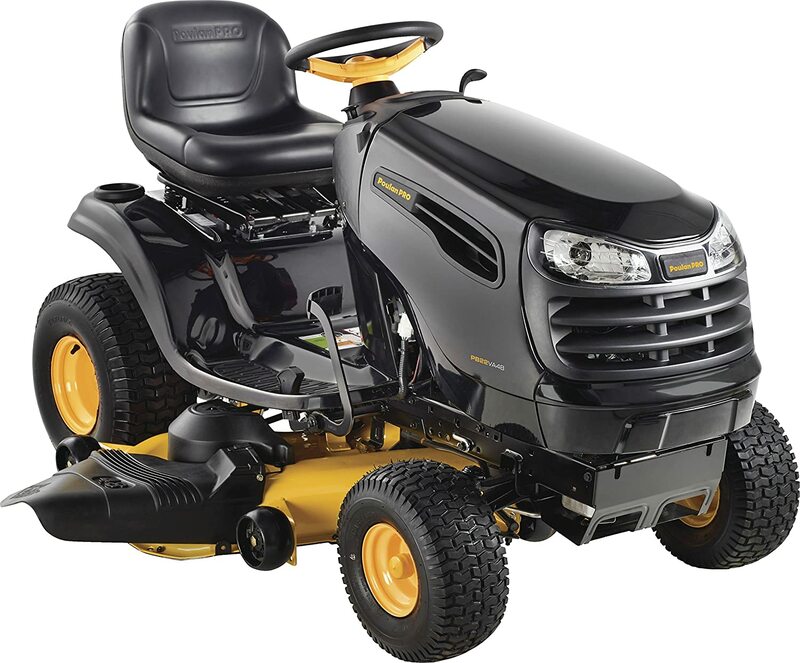 The Husqvarna garden tractor has an auto transmission for a maintenance free operation. The air induction technology will help the airflow for the same cut every usage. It has a deck wash port where you can connect the water hose for washing purposes. 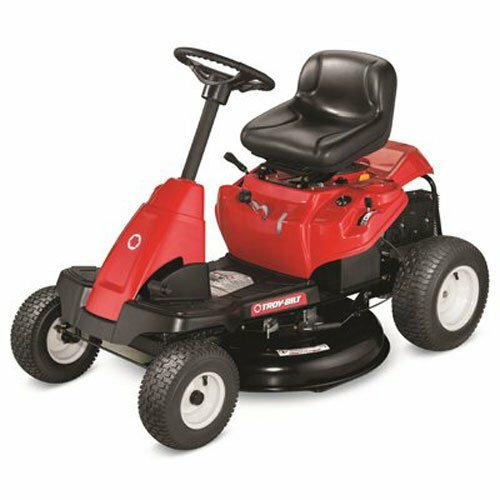 Yard Machines 420cc 42” Riding Lawn Mower is perfect in mowing grassy, hilly lawns. 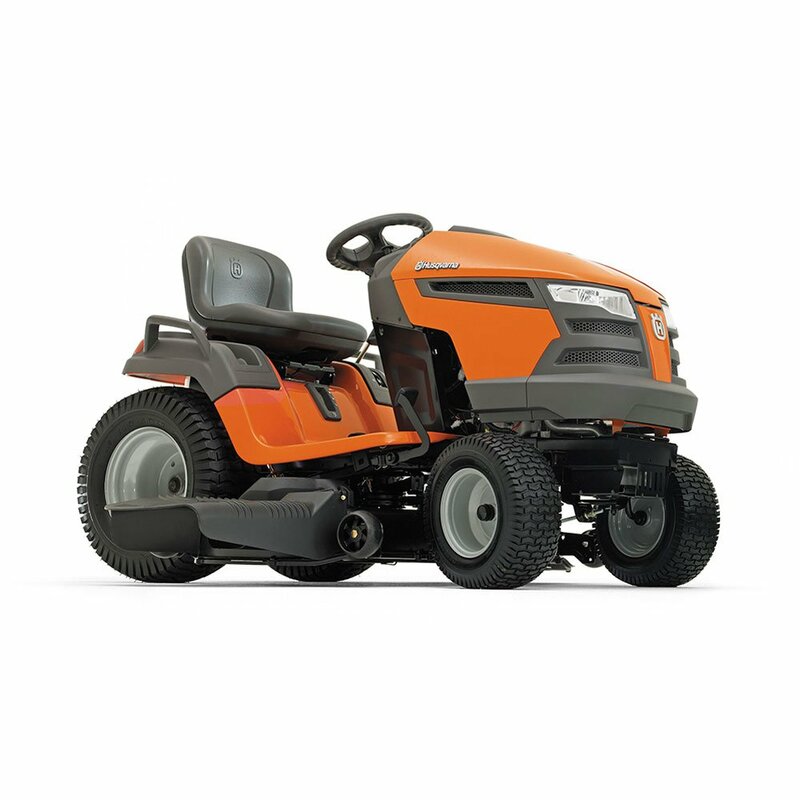 It is powered by a 420cc engine with the Shift on the Go Drive system, which ensures smooth and easy mowing. No matter what your mowing needs are, the Yard Machines Lawn Mower can accomplish with the seven-speed gear shift. The Yard lawn mower features a 42 inches blade for easy mowing in large areas. Another good thing about this lawn mower is the bagging and mulching capabilities. Troy-Bilt 420cc OHV 30 Inch Premium Neighborhood Riding Lawn Mower 2017 edition is equipped with a 30-inch cutting deck with 5 adjustable modes. With rather small dimension - 34x62x26 in, this tractor is suitable for standard lawn owners with medium-sized garden. The fuel tank can handle 1.3 gallons of fuel. The fuel sight window helps you gauge if you need to refuel or not. This machine is perfectly built to last for an extended period. The Troy-Bilt lawn mower has a standard take-off power for fast and easy engagement. To ensure the gardeners' comfort, the seat can be raised until the mid-back, while the steering wheel has a soft grip for extra comfort. These are the best garden tractor machines that are available in the market. Every needed information is already listed above. All you have to do is choose the most suitable. Among the products, the winner is Poulan Pro 960420186 Briggs 24 hp Automatic Hydrostatic Transmission Drive Riding Mower. It is easy to use and has a ReadyStart system for easy start. When choosing your garden tractor make sure it can fulfill the desired performance. In this way, working on your lawn won’t feel like a burden anymore. Do you have a favorite garden tractor? Let us know in the comments! Previous Post Best Expandable Garden Hose You Need To Know (Buying’s Guide) Next Post How Long Does Watermelon Last on the Vine and Harvested?